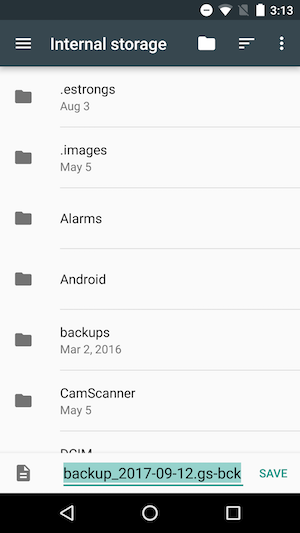 You can create manual backups of your Genius Scan documents and settings. 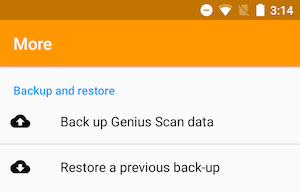 keep a backup of your Genius Scan data so you can recover them if your device breaks or gets stolen. Make sure to save the backup onto another device or in a cloud service. Want Genius Scan to back up your scans automatically? Subscribe to Genius Cloud and your documents will be saved to your account and available on all your devices at all time. The backup can take several minutes or more, depending on the number of documents you have. 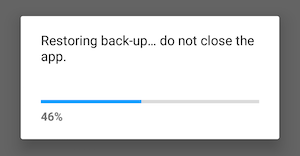 Do not close the app during the backup operation. 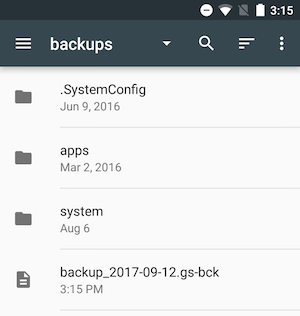 After the backup is complete, a file named with today's date and a ".gs-bck" extension is created in the folder you selected. This is your backup. Transfer this file to your computer or to another device. The restore operation can take up to 10 minutes if you have a lot of documents. Do not close the app during the restore or your data could become corrupted. When the Restore operation is completed, the app will restart and all your documents will be ready to use.